Keep cats warm without electricity by using our Slumber Pet Thermal Cat Mats. 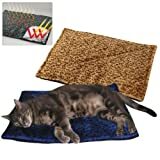 Thermal Cat Mat keeps cats warm and comfortable without the use of electricity. Features a lightweight core that actually reflects pet s own body heat back to the animal. Provides soothing comfort to cats, kittens, aging pets, nursing females, or animals recovering from illness or injury. Machine-washable pad features a pawprint.